Are Musical Instruments Only for Old Testament Worship? I’m a musician and worship leader, and have a particular love for music. When I went through the excellent 40 days of Purpose program, I was a bit offended by Rick Warren’s insistence that we not call the singing part of a service “worship” since everything we do for God is considered “worship.” I felt that he was devaluing the often unique, deep personal and corporate experience of God and community we can have through corporate worship. And, he was making me change my usage of the word! 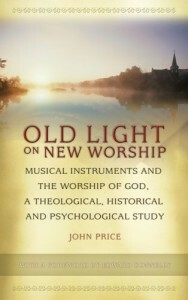 But now, there’s the new book by John Price with the accurate, if not cumbersome title Old Light on New Worship, Musical Instruments and the Worship of God. A Theological, Historical and Psychological Study. From my reading of this review at Banner of Truth (a publisher dedicated to promoting God-honoring literature), this book argues that instruments should probably NOT be used in New Testament worship, and that they may be hindering and polluting our worship of God. This type of argument keeps me on the edge of having angry fits, and I have to restrain myself from loudly mumbling words like “backwards, fundie, idiots” while I read. However, the author is not just some idiot shouting loudly down from his perch. Rather, he attempts to make sound scriptural and historic arguments, which the review at BoT summarizes. Rather than recapitulate them, I encourage you to read them. For me, his “crazy” theology does raise some good questions that ought to make us a bit introspective about our use of music, and it’s place in corporate Xian life. 1. Do we have to use music at every gathering? I actually do NOT like worship in small groups, it can be awkward, and difficult to get people to lose their self-consciousness enough to actually sing and mean it, or lose themselves in communion w/ God. However, group silence or prayer seems much more worshipful in small group settings. And if your small group has unbelievers present, any attempt at worship will probably make them very uncomfortable. Most visitors, however, can endure a short time of group prayer, since all you have to do is close your eyes and wait, maybe even pray some yourself. 2. Do we put too much emphasis on corporate singing, while de-emphasizing other activities that might be part of corporate meetings? I’ve been to some churches where the worship is longer than the preaching. I have no problem with that, since many preachers are neither succinct nor engaging (nor anointed, but that’s a different issue), but are we missing out on things like corporate communion, or service to the needy, or public testimonies that might encourage us all? 3. Do we have modern styles of music but no personal devotion to God? As an ex-patriot Charismatic in an evangelical world, I have oft noted that many Evangelical churches have the modern rock forms of contemporary worship, but they often lack the spirit of surrender, direct encounter with God, and anointing of charismatic worship. That is, they are still just song leading, not worship leading. 4. Are certain forms of music dangerous if mishandled, or just evil by nature? Having enjoyed a drum circle, I can attest to the power of certain rhythms creating certain atmospheres, and the power of a rhythm to call up feelings, maybe even spirits, is not that far-fetched. 5. The absence of musical worship in the NT does not mean it should not be part of our experience. To say that musical worship is merely an OT practice that foreshadowed our current relationship w/ Christ is weak. Not only that, I suspect that his study of church history ignores Martin Luther’s love of music. I am not of the opinion that all arts are to be cast down and destroyed on account of the Gospel, as some fanatics protest; on the other hand I would gladly see all arts, especially music, in the service of Him who has given and created them. 6. Contemporary music and the use of music is just an extension of using modern language, it’s profound communication. Despite any stunning theological proofs in this book (which I have not read), I am of a firm belief that music, like all of creation, is a gift of God to be used rightly, for our enjoyment, and in his service. The rejection of the arts and sciences is a trademark trait of extremist fundamentalism, as mentioned in Is Man Good or Evil? Because fundamentalists have a mistrust, even hatred for the natural abilities of humanity, they often damage the souls of the very people they try to help by teaching that we should reject all things that smack of human endeavor or ability. This can include disparagement of one’s natural abilities and interests, and in extreme cases, of the sciences (which rely on man’s mental abilities, which are “corrupted by sin”), the arts, and even of any encouragement of individualism and personality. This new book seems like a good primer on anti-music or anti-instrument theology, so if you are interested in what this school of thought teaches, if for no other reason than to refute it and develop a healthy theology of music, you might check it out. It would also be ignorant of NT scriptures to claim that music and singing was not part of the church immediately after Jesus was resurrected and before. …speaking to one another is psalms and hymns and spiritual songs, singing and making melody with your heart to the Lord. It seems clear to me that the NT church uses singing as part of their expression of worship to God. And while I don't know enough about Warren to either attack or defend his statements on worship – I do tend to agree that people think that the only time they "worship" God is when they sing. Scripture is equally clear that the way we conduct our lives is to be our "spiritual act of worship" as Paul says in Romans 12. He doesn't object to singing, just musical intruments. Some of us cannot sing and you DO NOT want to hear us singing without some type of instruments to drown us out. LOL! What about joyful noise and all? Scripture says the Lord enjoys the Joyful noise, that doesn't mean everyone else has to.